Individual mailboxes must adhere to the same regulations whether they are placed in town or along a rural highway. However, rural delivery can lead to additional considerations regarding placement of the mailbox on your property or on the road. U.S. Postal Service (USPS) policy specifies measurements for distance to the curb, height from the ground and more, but does leave some options to the box owner. If you are installing a new rural mailbox, always contact your local postmaster first to determine where to locate it. Then install the box 6 inches from the curb and 41 inches above the road on a four-by-four post. The USPS approves general mailbox styles that can be used for curbside delivery. They are classified in three categories: traditional, contemporary and locked, with full or limited service. According to USPS policy, new customers must install a box with an approved design, unless prior permission is obtained from the postmaster of the local delivery office. If you have plans to install a custom box, contact the USPS at 1-800-ASK-USPS to locate your local postmaster and request an appointment to discuss your idea. Beyond the box itself, the post office also has specific guidelines regarding placement of the mailbox on the curb. The box, measuring from the door, should be 6 to 8 inches from the curb. The lower level of the box needs to be 41 inches to 45 inches above the surface of the road. Mount the box on a four-by-four wooden support or a 2-inch diameter standard steel or aluminum pipe. Use of these materials helps ensure the post will fall away or break if it's hit by a car. When installing a box at a new address, contact your postmaster to determine where to place the box. In some areas, the post office requests boxes in a given region be grouped together to promote efficient delivery. You may also be able to mount it directly in front of your home. When replacing an existing box, use the same location. What Is the Required Height of a Rural Mailbox? What are the Standard USPS Requirements for Residential & Commercial Mailboxes? Before installing your new box, place your address on the side or on the front of the box itself. For mailboxes in a cluster, stencil or adhere your address to the door for carrier reference. On a stand-alone box, side numbers on the right side are more conspicuous for both mail carriers and emergency personnel attempting to locate a street address. If you use stickers, opt for reflective stickers to make your box more visible at night. Also consider using reflective tape or markers for your mounting post to increase visibility. 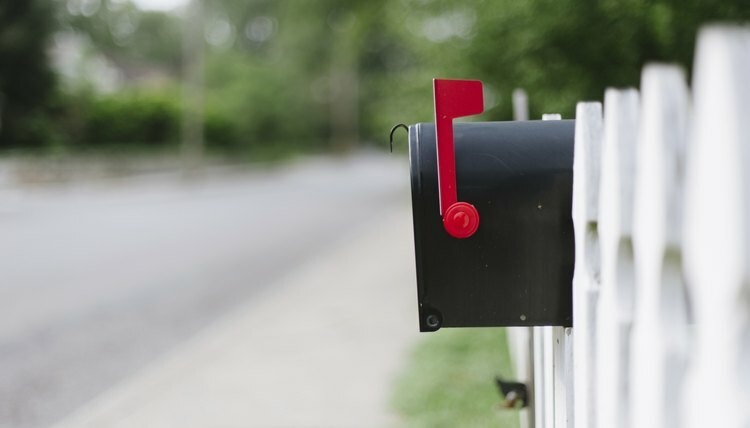 Before embarking on a crafting project, contact your local postmaster to get approval for a personalized mailbox. Familiarize yourself with the construction of USPS-approved designs and utilize a similar door and flag size, as well as door and flag placement. If you want to customize a pedestal or mount, consider designing the unit to accommodate an approved mailbox design and enclosing the box. For example, many designers of tractor mailboxes use an existing box and attach other elements, such as tires and a canopy, to complete the look. Adams-Mott, Ashley. "Rural Mailbox Regulations." , https://legalbeagle.com/5506278-rural-mailbox-regulations.html. 12 December 2018. What are the Laws for Apartment Dwellers' Mailboxes?